The driving wheels arrived at Buckfastleigh on Wednesday 18th December and it is anticipated that they will be fitted to the axles as a first stage. Fitting of tyres will follow and then crankpins. Axlebox machining is in progress at Bridgnorth, various machines are involved in achieving the finished product and there is much to do before they are ready for fitting. In addition to all the machining, there are manganese liner plates to attach to the sliding surfaces and whitemetaling of the bearing surface on to the axle journal and also the side thrust face of the axlebox. The latest news on the cylinders is that Cerdic Foundries hope to have the mould for the first cylinder ready before Christmas with casting to follow after the holiday. Back on home turf the preparation of holes for riveting at the rear end of the chassis draws towards a conclusion with riveting sessions expected early next year. Hopefully experience gained at the front end will stand us in good stead at the rear as access to some rivets is awkward to say the least. It's been an excellent year for our locomotive and I wish to thank all our supporters, suppliers and of course `Team 82045` for a superb year. Very best wishes for Christmas and a very happy 2014 from Barbara and myself. The wheels at The Boro' Foundry, when Peter Line and Tony Massau went to inspect them. The wheels are now at Buckfastleigh. 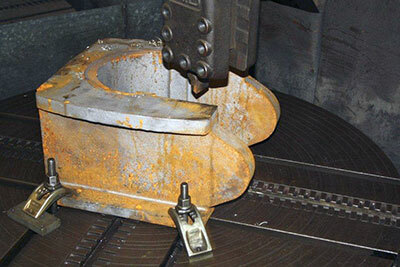 Axlebox on vertical borer, first machining operation. A stack of axleboxes following first machining operation on the vertical borer. 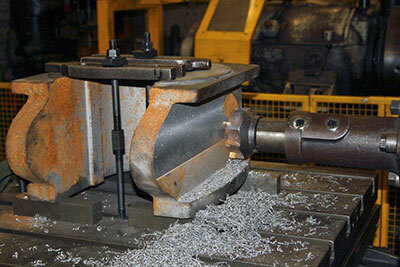 Axlebox on horizontal borer, second machining operation. As a preliminary to writing these notes, I've just been looking at the December 2012 summary of progress and predictions for the year ahead (i.e. this year, already nearly at an end), as well as at the monthly updates to the website. I am pleased to say that there was nothing in the notes at the end of last year that was excessively optimistic: 2013 has been another year of excellent progress, though, as I have written elsewhere, much of this has been invisible to the casual observer. 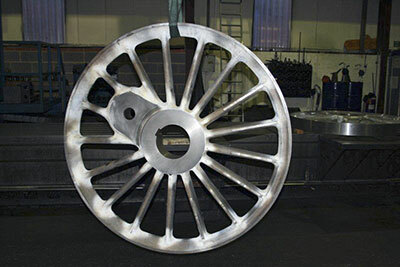 The year started with the order being placed for the six driving wheels, and finishes as the completed, machined wheelpans have been despatched from The Boro’ Foundry and are now at South Devon Railway Engineering awaiting assembly into completed wheelsets. The wheels look absolutely splendid, as the photographs show. All this, of course, comes at a cost, and the Wheel Appeal bank account is about to be seriously depleted as a cheque for the casting and machining of the wheels wings its way to the Black Country. Nevertheless, we are perfectly calm about this, thanks to the success of the Appeal, to the 2012 Gift Aid repayment which we received in November, and to our recently-acquired status as a VAT-registered company. This is predicated on future income from SVR steaming fees and the fees for hire to other railways: make no mistake about it, 82045 is going to be hot property and very much in demand when she is completed. We are heartily glad to have been freed from this wretched tax: as a not-for-profit company which exists only thanks to the generosity of its members in donating their already-taxed money, we were faced with a lose-lose situation and bitterly resented having to pay it. Thank you to our Treasurer Alan Brighouse, and to independent auditor Paul Seton for sorting out our application, and also to HMRC for their fair response. 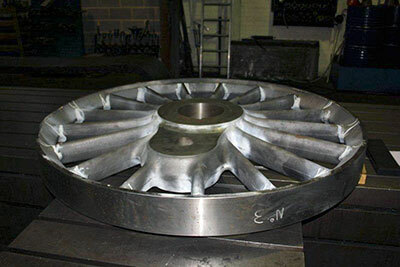 Still on the wheel front, attention is now focused on the axle boxes, cast with great efficiency by the South Lincolnshire Foundry in August and now being machined, courtesy of our highly skilled 82045 engineers in the Bridgnorth workshops. 82045 has the same rear pony assembly as does BR Class 2 tank 84030, currently under construction on the Bluebell Railway, and we have established a good working relationship with the group concerned, as it seems sensible to have the parts for the pony truck made in tandem for the two locomotives. The other major component in the offing is the cylinders. As you may know, the NYMR borrowed our pattern to cast a cylinder for their Class 4 mogul 76079, and we were glad to learn that the casting and machining were a success and that the cylinder is now fitted to the engine. 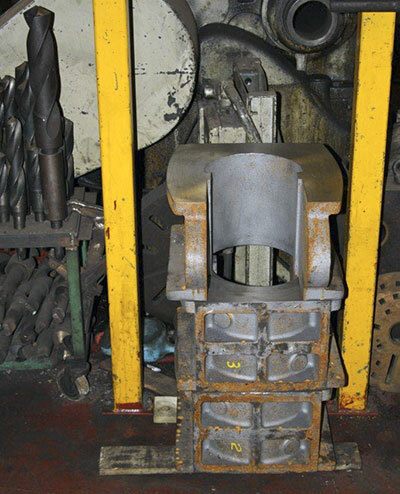 This means that we can now confidently have ours done, and Cerdic Foundries will shortly be casting the two cylinders for 82045, after which they will go for stress-relieving before heading off to Williton Works on the WSR to be machined. Aside from these major items, work has gone on throughout the year – aided by the unexpectedly good summer weather – on completing the frame assembly so that we will be ready to receive both wheels and cylinders when they arrive at Bridgnorth. The manganese steel liners for the axle boxes have been cut and machined (no simple job, as this stuff is hard! ), and had their lubrication grooves cut, and are now in store ready for the machining of the axle boxes themselves to be completed. Much of the work on the frames, while absolutely essential, is not very spectacular, and we have watched as some other new build projects – and good luck to them – have basked in a blaze of favourable publicity as a result of their spectacularly photogenic appeal. We have taken a different approach to the construction of 82045, reasoning that, by getting all the building blocks soundly in place, we will be in a good position to take advantage of the photogenic potential of the engine when the time comes: and I’m glad to say that this is fast approaching. If you take as an analogy the life-cycle of a butterfly, the long larval stage of the Riddles tank is finally nearing its end, and by this time next year 82045 should be starting to flex her wings as a rolling chassis - cylinders in situ and a gratifying bit of lined green “bling” on display in the shape of the running plate valances. Oddly enough, the really eye-catching superstructure components – tanks, bunker, cab, smokebox – are comparatively inexpensive being fabrications from sheet steel, so we are not anticipating any difficulty in adding these (no decision as to when we will do this has yet been taken). As you may have read elsewhere, reliable income streams are in place for all major parts of the engine except one – no need to tell you which one - and 2014 has been designated the year of the Boiler Appeal. This will kick off in the late winter with an appeal to the wider membership of the Severn Valley Railway in SVR News entitled “Let’s Put The Heart [with fiery heart graphic] Into 82045”, and will be followed at phased intervals with further appeals to the wider enthusiast community. The heart motif – it came to me on a deserted, windswept North Anglesey beach on a grey day in late October - is an unashamed attempt to tug at the emotions, so I hope it will do the trick next year and, initially, boost the percentage of SVR members supporting us from the existing 5%, which we’ve always felt could be improved on. I’m pleased to report that, even in advance of the “official” launch of the Boiler Appeal, a number of generous donations have meant that there is already enough in the account to fund the boiler barrel, though matters of storage space at our Bridgnorth HQ mean that we will not be commissioning this job just yet. Before I take my leave of you for 2013, I would like once again to pay tribute to our engineering team, who have worked through the year in all weathers, and have, over the life of the 82045 project to date, saved us hundreds of thousands of pounds and enabled our finances to be used to best effect. We have been immensely lucky to have assembled such a multi-talented team; the in-house skills on which the project is able to draw, together with the essentially practical nature of this new build locomotive, are our greatest strengths. It remains only for me to thank those of you who have supported us so generously: we’d be nowhere without you, as I think I said twelve months ago; to ask those of you who have hesitated to support us up to now to think about helping 82045 take to the rails as soon as possible; and to wish you all a Happy Christmas and all the very best for the New Year. Floreatis omnes, floreatque 82045 - as the Romans certainly never said!